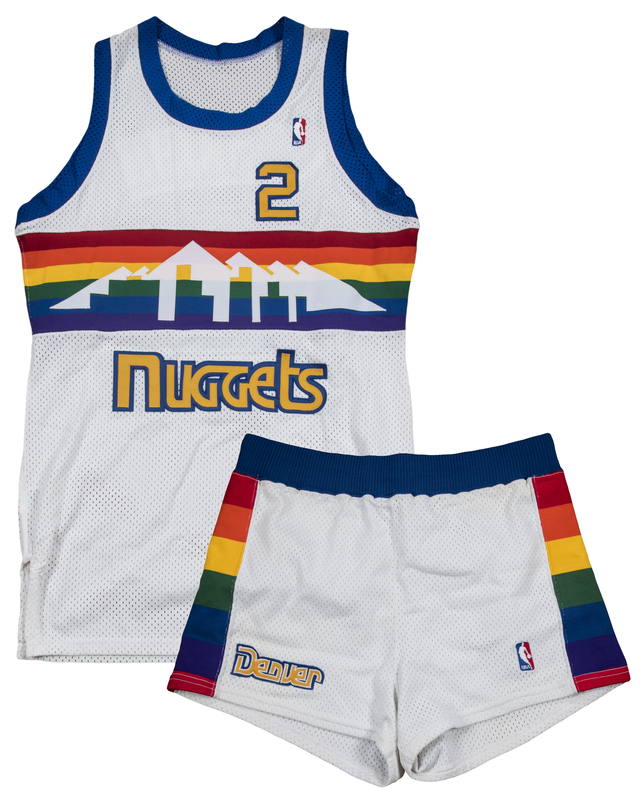 Hall of Fame forward Alex English wore this Denver Nuggets home uniform during the 1989-90 NBA season. English, in his 14th NBA campaign, started 80 games for the Nuggets in his final season with the team. English was part of a balanced scoring attack for the playoff-bound Nuggets, dropping 17.9 points per game as one of three Nuggets above the 17 points per game mark. Doug Moe’s Nuggets made the playoffs yet again with English at the helm, largely due to the consistent contributions made by Moe’s veteran stalwart and team leader. English finished the season with 24,850 career points, and he would surpass the 25,000-point milestone during the 1990-91 season with the Dallas Mavericks. English retired after his lone season with Dallas, and in 1997 was inducted into the Naismith Memorial Basketball Hall of Fame. 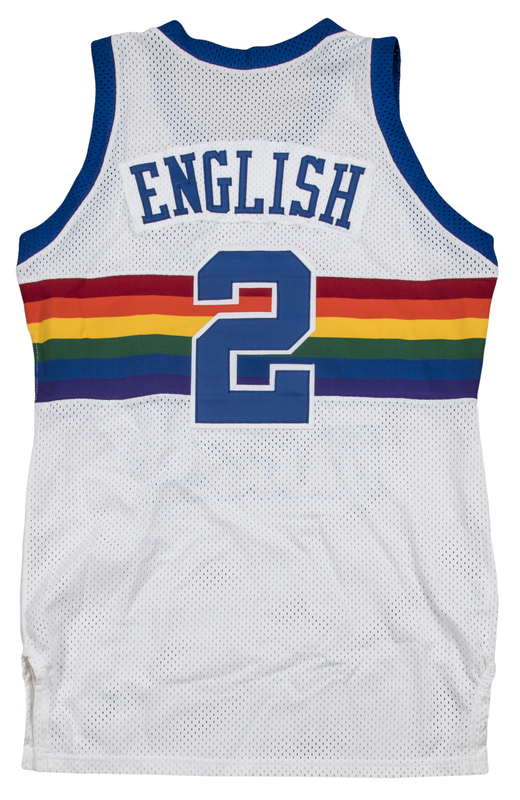 This offered home uniform consists of English’s jersey and shorts from the 1989-90 season. 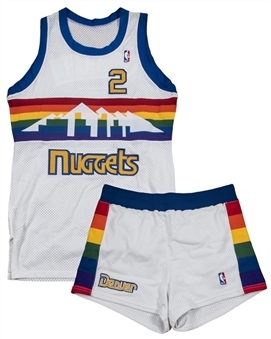 The jersey is white, with the Nuggets iconic rainbow pattern printed across the chest and back. 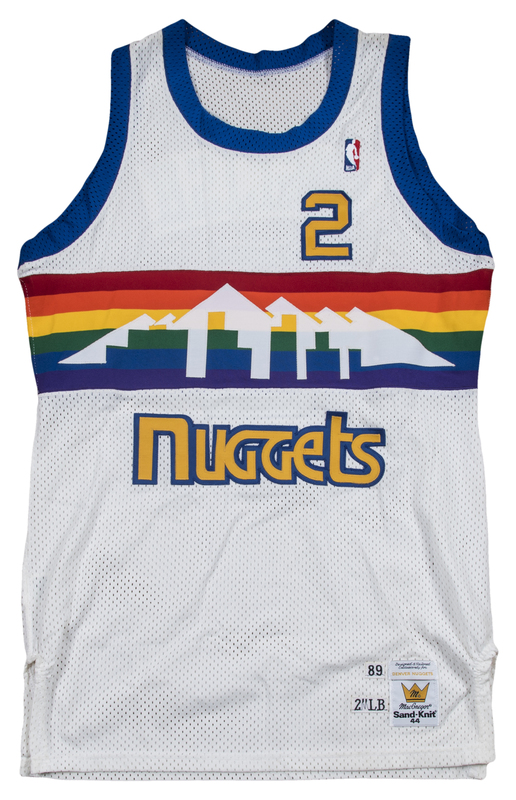 White tackle twill mountains are sewn inside the rainbow pattern on the chest, while “NUGGETS” and English’s number “2” are sewn on the chest in gold and blue tackle twill. 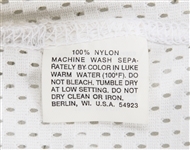 “ENGLISH” is sewn across the back shoulders in blue tackle twill over a matching white nameplate. 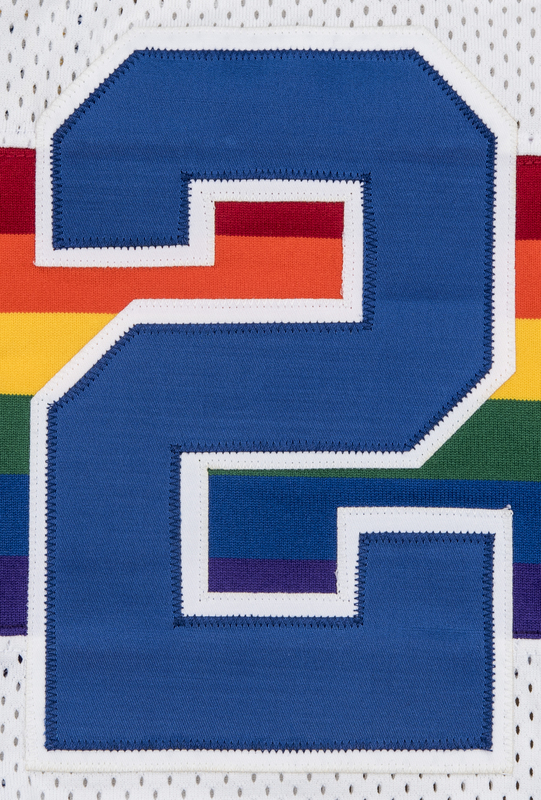 English’s number “2” is sewn on the back in blue and white tackle twill. The sleeve and collar openings of this jersey are bordered with blue. A NBA logo is sewn on the chest. 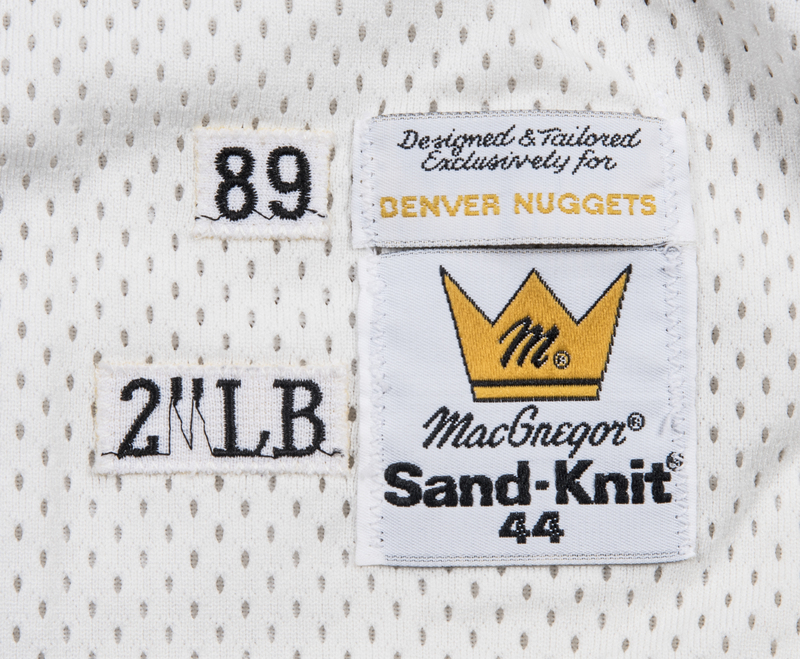 Tags sewn on the front left tail include an “89” year marker, a “2[inch] L.B.” tag, a “Designed & Tailored Exclusively for Denver Nuggets” tag, and a MacGregor Sand-Knit size “44” tag. Also included in this lot are English’s sorts. They are white, with a rainbow pattern going down the side of each leg. 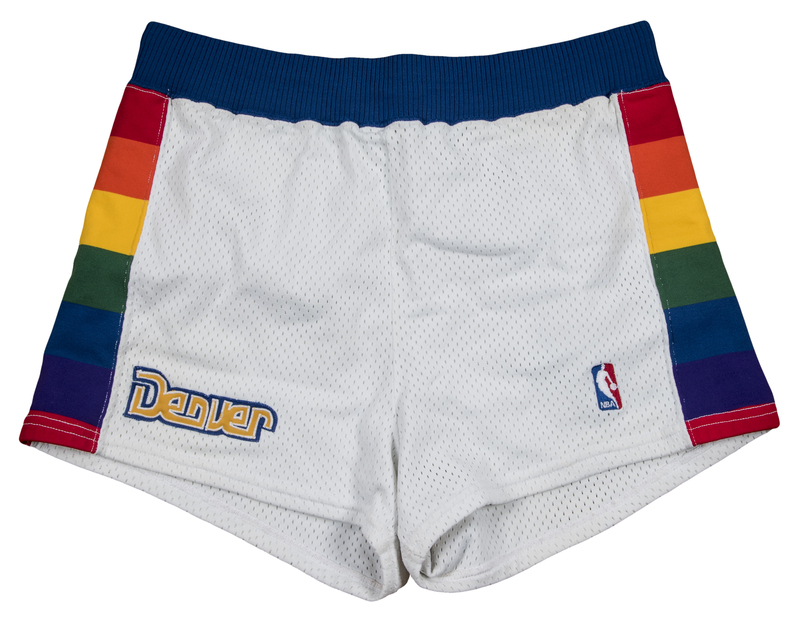 “DENVER” is sewn on the lower right leg in yellow, white, and blue tackle twill while a NBA logo patch is sewn on the lower left leg. 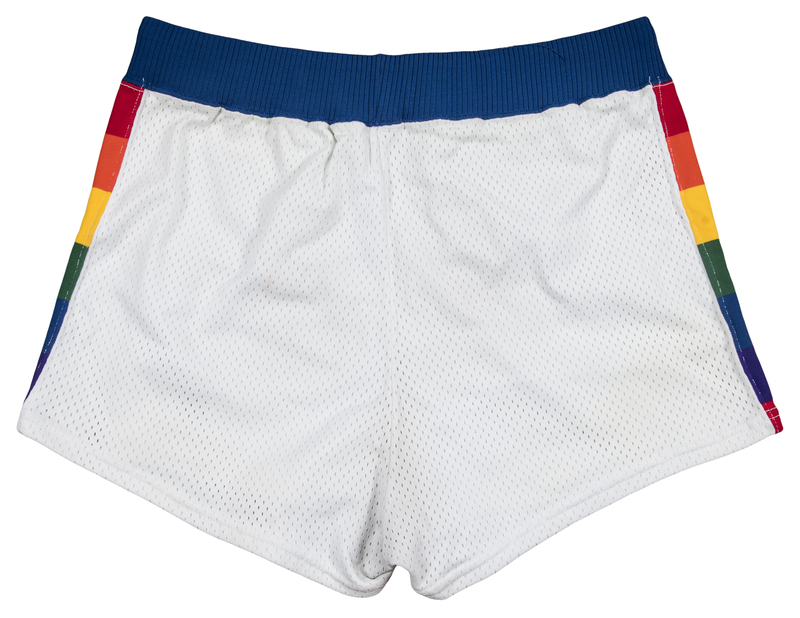 The waistband is blue, with a Sand-Knit tag and a size “34” tag sewn on the inside waistband. 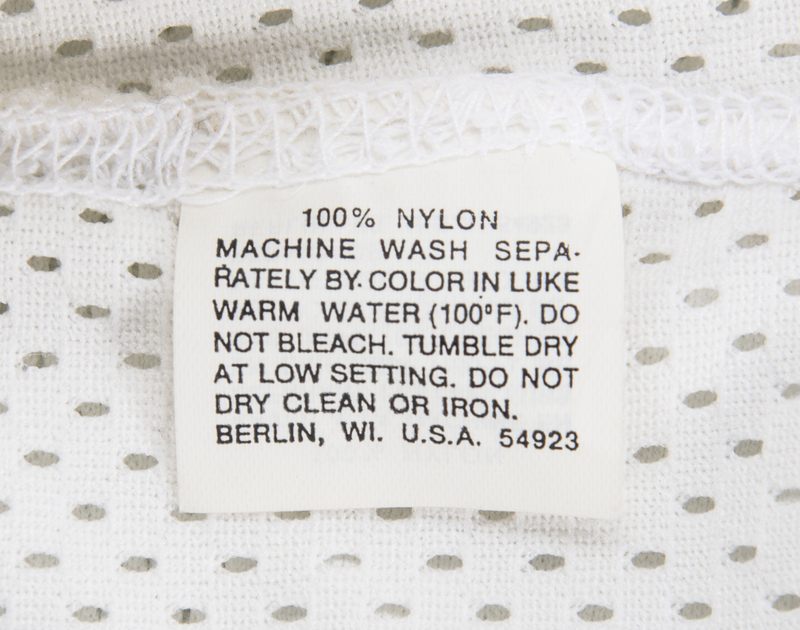 English’s number “2” is handwritten on the size tag in blue marker. 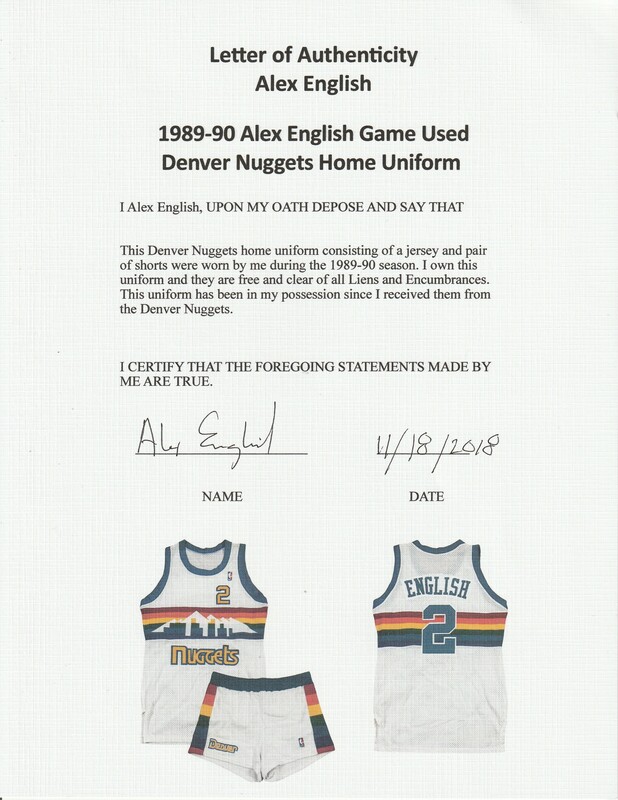 This uniform is accompanied by a LOA signed by Alex English himself.